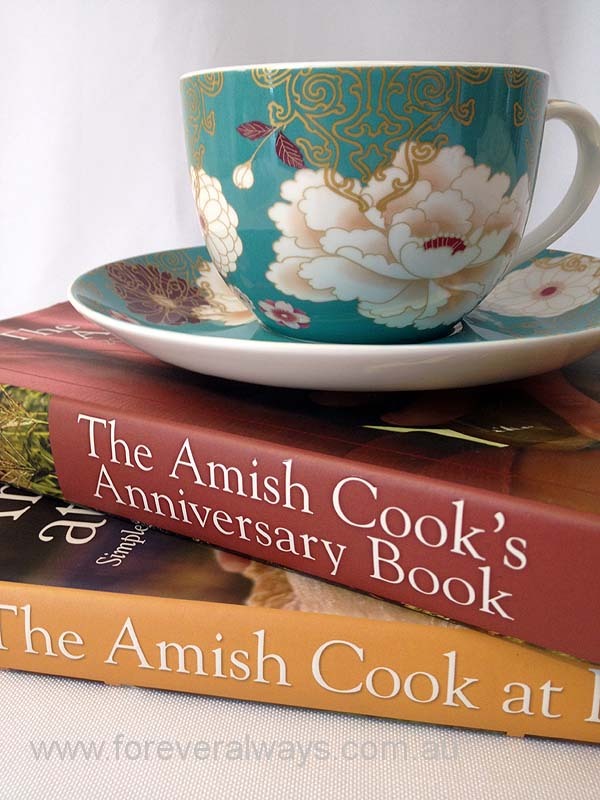 Our Forever Always Family, loves to share Recipes, so here you will find a collection of tried and true Recipes that we love. You will also find our favouritest that are served at 12 hour Crops, and Retreats. 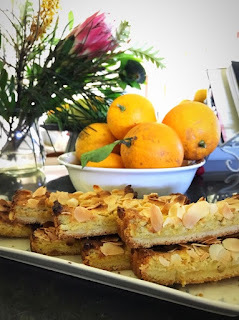 After finding a couple of trees full of oranges - I decided I need to find something that used oranges, was gluten free but not the usual boiled orange sweetly sticky syrupy cake I usually make. I wanted something crisp and crunchy but moist but not too high in sugar. 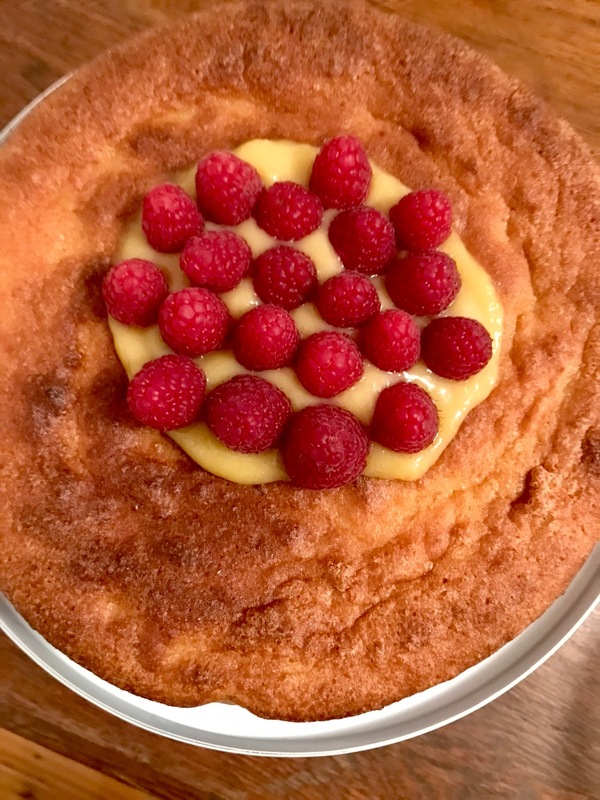 So after searching the net and reading a few recipes I’d collected I decided to tweak a couple and see how I ended up. Put the orange into a small saucpan and cover with water. Bring to the boil, then reduce the heat, simmer, covered for 30 minutes or until soft. 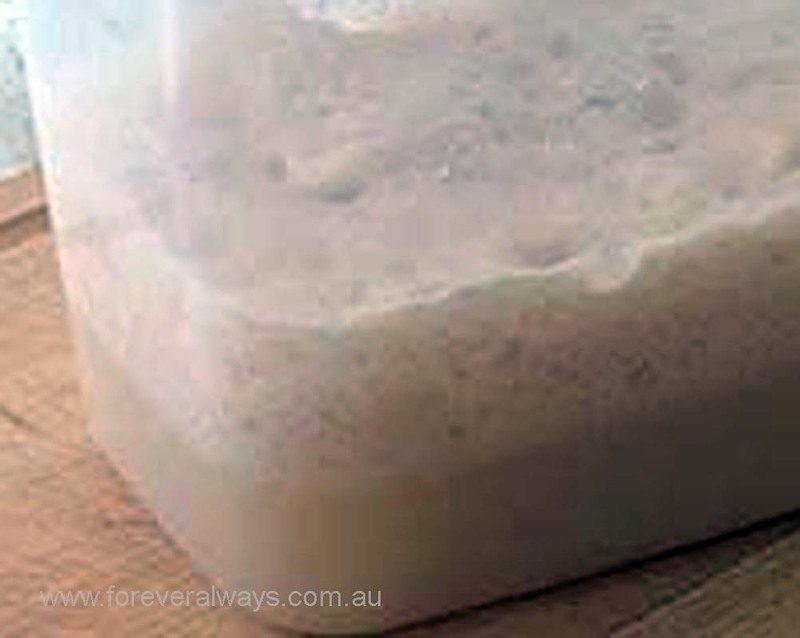 Add rice flour, cornflour, almond meal and icing sugar in to jug of thermomix and process briefly to just combine. Add the butter use the turbo for a couple of turns just until a dough forms. Press the dough into the base of the tin, then refrigerate for 30 minutes. Drain, cool and cut the orange in half widthways, remove any seeds, and turbo blitz the orange until smooth. Fold in the orange purée and almonds. Using clean beaters, whisk the egg white in a clean, dry bowl until stiff peaks form. Add the extra sugar, beating until well combined, then fold into the orange mixture. Gently spread the filling over the base. Bake for 40 minutes, or until lightly browned. Cool in the tin, before removing tin from base and slicing. This will keep for a couple of days if it lasts that long in an airtight container. 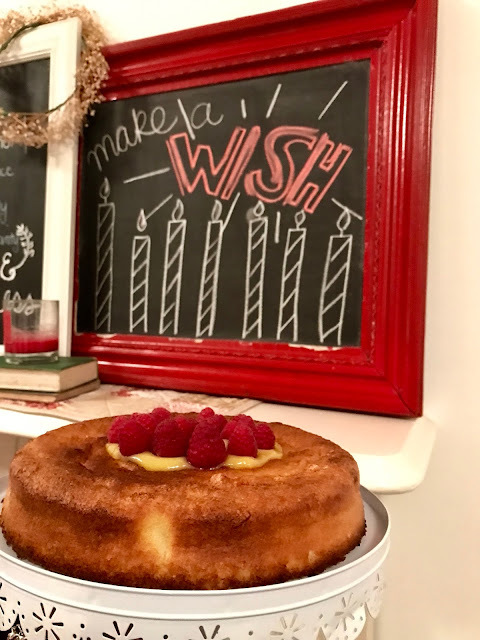 With a birthday looming, and a lifestyle change - baking was on the no go zone, but birthday's need cake right. Add in dawn service and busy days... so the birthday girl requested quick easy and lemony. google search, brings me to this Torta Caprese Bianca - just the name makes it appropriate for the birthday girl... so we gave it a try. NON Dairy and NON Gluten - lets see. 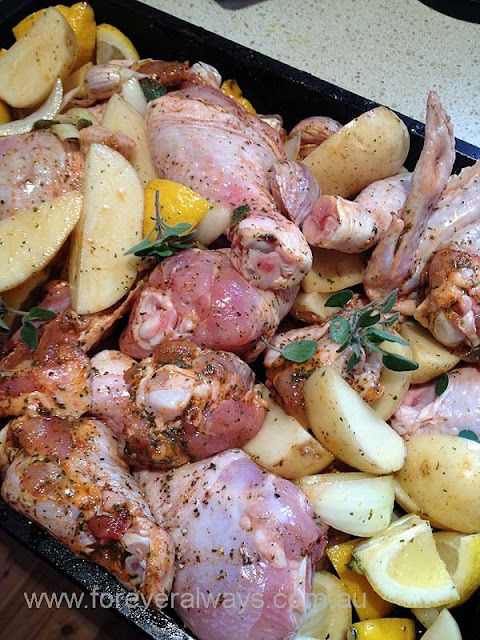 Preheat your oven to 180°C and grease a 10" / 26cm pan or line it with parchment paper. Combine the white chocolate and coconut milk in a microwave safe bowl. Heat in 30 second increments and stir after every 30 seconds. Set aside to cool while you prepare the rest. Beat the butter with 100 grams of sugar and beat until fluffy. Add the lemon zest, egg yolks and lemon rind and beat until well combined. Then add the almond meal and the melted chocolate. Add the lemon juice and beat until combined. In a separate bowl with spotlessly clean beaters, beat the egg whites until soft peaks form. Gradually add the remaining 30 grams of sugar to the egg white mixture. Fold the egg whites into the almond batter until well combined. Spoon the batter into the greased pan and bake for 40 - 45 minutes. 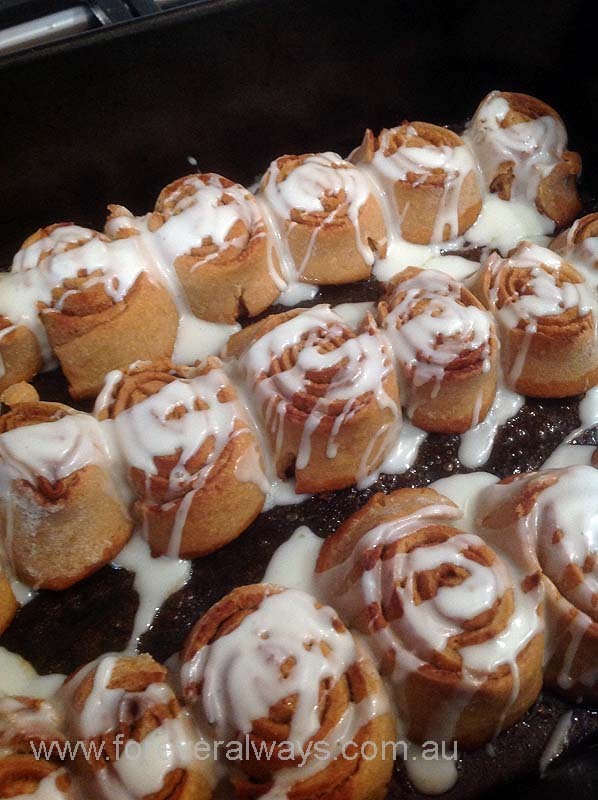 Let it cool completely in the pan. But don't be surprised that on cooling there will be a slight sinking. 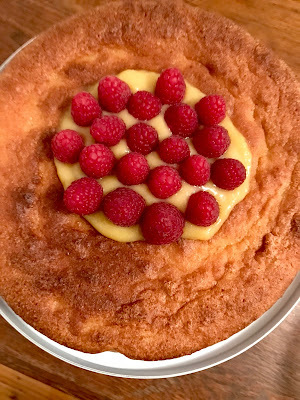 This is where I poured my optional lemon curd and topped with raspberries. 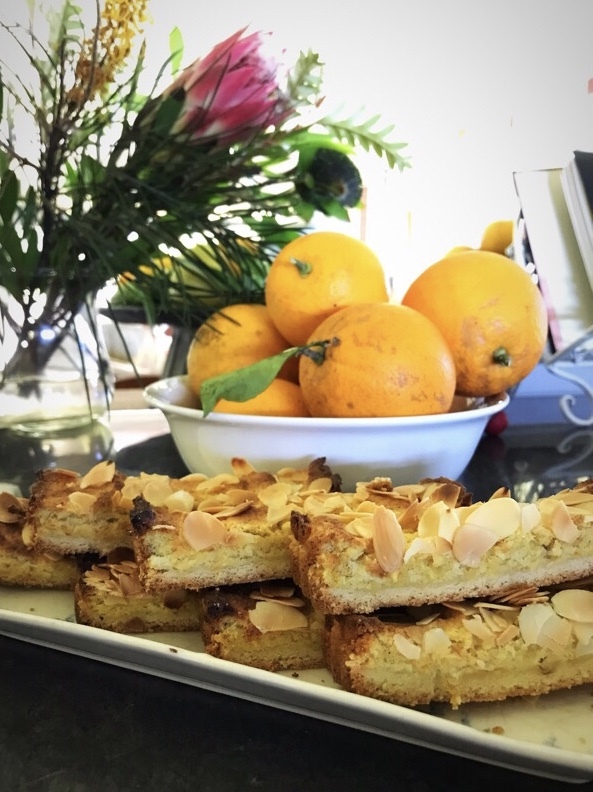 Donna's Mother In Law shared this recipe with me when I was in Coonamble, and after baking it I knew it was a keeper. Although I am embracing my Gluten and Dairy free lifestyle. I am allowed to enjoy a little Grain Fed Butter, occasionally. 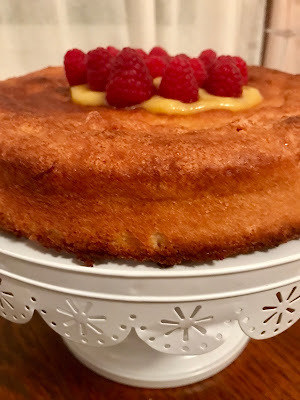 So with treats being craved and that crazy easter season upon us... it was time for a little bit of baking and definitely time to share with you. Trying out recipes for the thermomix, loving my new tool in the kitchen. Natalie suggested the Thermomg Must try for beginners list on facebook today, so we decided to give it a try. 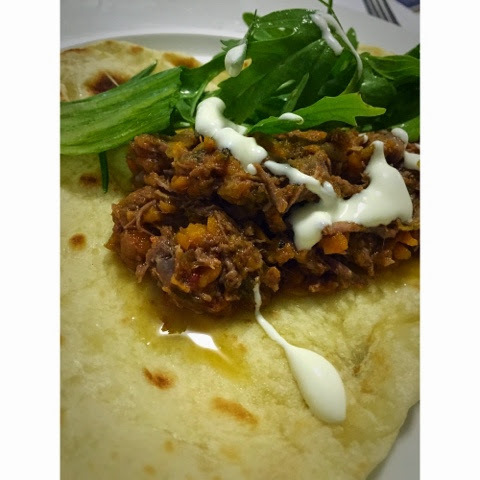 OMG smelt amazing, tasted even better, and it's the best flatbread I've cooked, like anything I tend to cook the recipe got tweaked to what I had in the cupboard. So I'll share it here so I can remember. 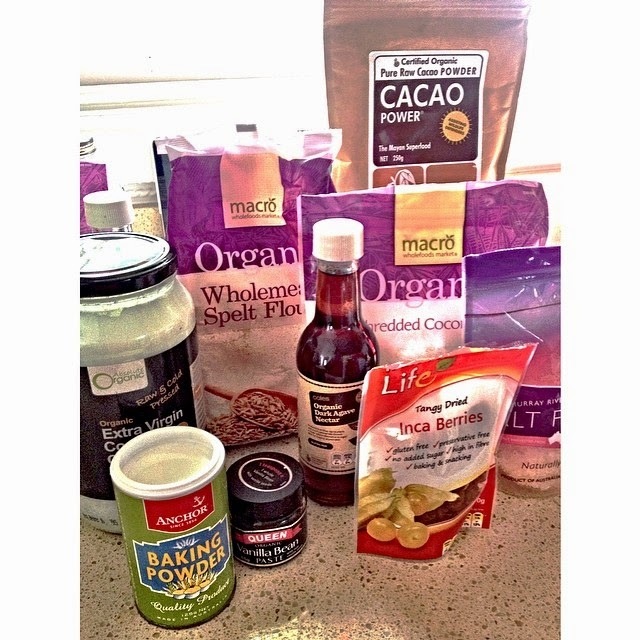 Add all ingredients into thermomix for 5 seconds on speed 6. Then 2 minutes on dough setting. Empty out on to Thermomat, this is the recipe as direct from Thermomg blog, but at this point I found it a touch wet, so I dusted some flour on my mat and dough and kneaded for a bit by hand before setting aside for the until the last 15 minutes of my ragu cook. Then divided into 8 potions and rolled into freestyle shapes and cooking in a hot dry pan. 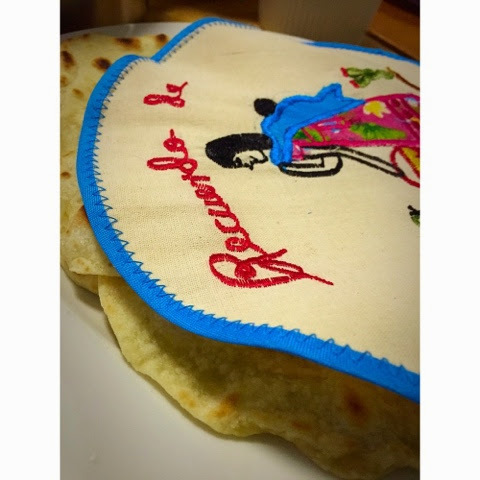 Keeping warm in my tortilla warmer. Into thermomix add carrots and celery for 2 seconds speed 5, place into a bowl and set aside. Without rinsing, add onion and garlic and chop for 3 seconds speed 5. Add ham, oil and return celery/carrot mix and cook for 10 minutes on Varoma Reverse Speed 1. Add all remaining ingredients and cook for 45 minutes at 100deg on Reverse Speed 1. ROLL AND COOK FLAT BREADS AFTER SETTING THIS NEXT STEP. Cook for a further 15 minutes on Varoma Speed 1 removing measuring cup and replacing with basket. 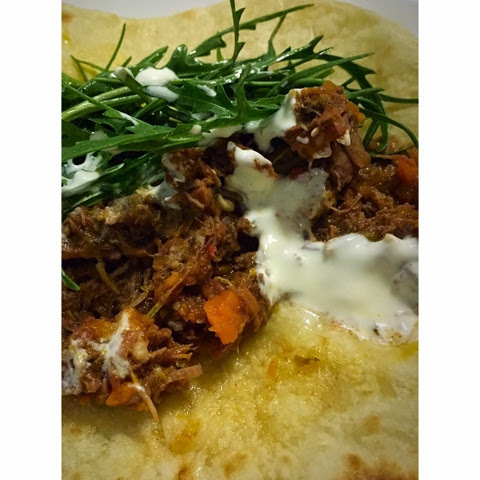 Plate up some Ragu onto a flat bread, add some lemon/olive dressed rocket and drizzle a little natural yoghurt. Enjoy!!! Preheat oven to 180C and line 24 mini muffin tins with papers. 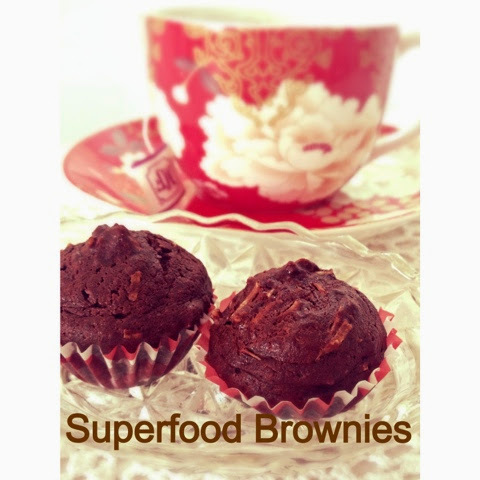 In a small bowl mix together flour, cocoa, baking powder and sea salt. In a medium saucepan over low heat, melt coconut oil. When melted, whisk in the Agave. Stir in the eggs one at a time until fully incorporated then stir in the vanilla, Inca berries, coconut. Combine thoroughly. I put my mix into a silicone piping bag and squeezed into prepared mini muffin tins and cook for 13 minutes or until a toothpick inserted in the centre comes out almost clean. I had enough mix to do 33 mini muffins. I was recently given a couple of new Cookbooks, and the first thing upon flicking through that struck me was the Sourdough bread. 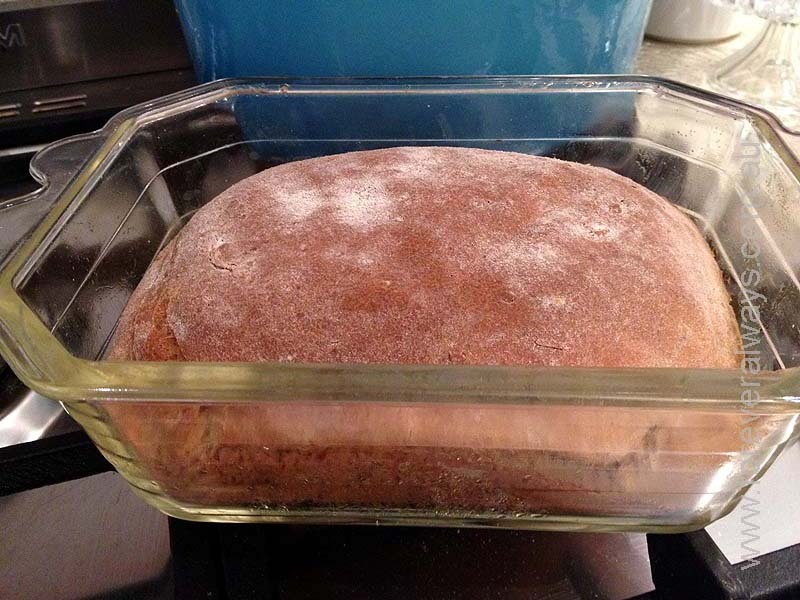 Knowing that we are paying upwards of $7 a loaf, it was high time I started baking it myself. So after almost a week of preparations it has happened today.... it's been a long day but it's been worth it - well I have only had the Cinnamon scroll for afternoon tea so far, the bread will accompany our dinner I think it will do nicely mopping up juices. So you need to start with a Sourdough Starter. 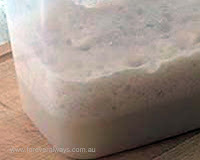 Mix the yeast and warm water in a small plastic container - one that will hold about 3 cups. Seal and refrigerate for 3 to 5 days. combine the sugar, potatoes and water in a small bowl and stir into the starter. Cover loosely (allowing the pressure and gasses that will build to escape. Let stand at room temperature for 5 to 12 hours. Take out 1 cup to make bread and loosely cover the starter and return it to the refrigerator. Combine the sugar, oil, salt, water, flour and starter in a large bowl. Stir to make a dough. Grease another larger bowl, place the dough in a turn to coat with the butter. Cover with waxed paper and let stand overnight. DO NOT REFRIGERATE (as we are in winter, I decided to leave the oven door ajar with the bread in ant the temp on as low as it would go about 25 all night - I will try without this next time and report the difference. The next morning, punch the dough down and divide half. My mix was very wet, and it took more than the 8 to 10 times of Kneading and almost a cup of flour before I had a dough that I could cut in two. 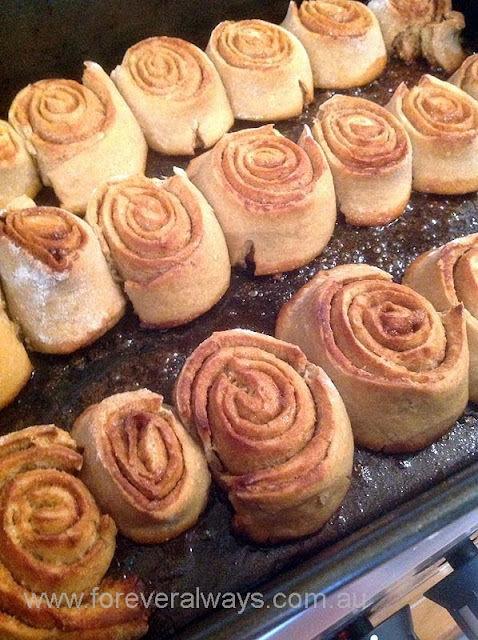 Set aside one half of the mix to make Sourdough Cinnamon Rolls see below. Grease a pan place loaf in pan and turn to coat. 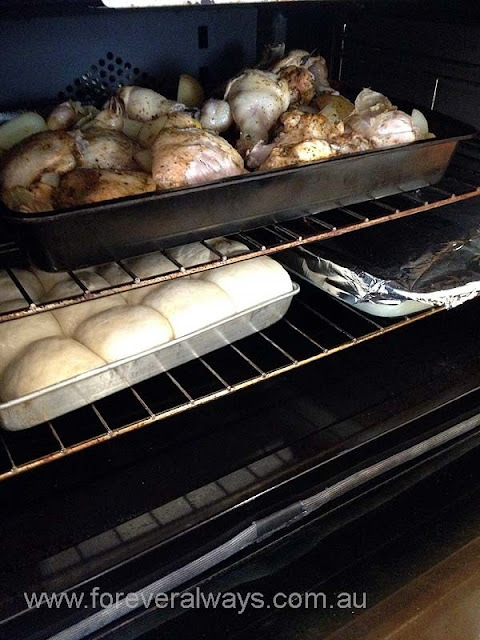 Cover with wax paper and a towel and place in a warm spot for 4-5 hours to rise. Roll out your set aside dough as thin as possible. sprinkle with brown sugar and cinnamon evenly. roll up the dough into a long sausage. Cut into slices 1/2 inch thick. Place the slices 1/2inch apart in a buttered tray and cover with wax paper and a towel and place with the bread in a warm spot for 4-5 hours to rise. Bake alongside bread in the oven at 200 for about 20 minutes, then while still warm drizzle with icing. OK, well the books look a lot more fluffy than mine, but I did use the Rye flour so I had expected a more dense loaf, but they are soooo good. Friends coming to lunch, and wanting something new to try Pinterest becomes my go too at the moment. I wanted a slow cooked, succulent and soft roast with my soft bread and a nice grilled vegetable salad....thinking yes should tick all the soft maybe to try and eat for the Wisdom Tooth extracted Daughter. 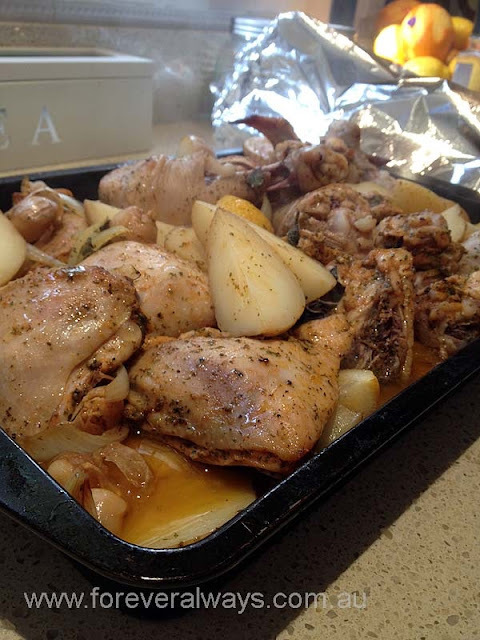 After reading lots of different slow cooked chicken recipes, they all seemed very similar to one I had done before that is a Nigel-la recipe - so here is what I did. 1 head of garlic, crushed and bruised, cloves still have the skin. Pre-heat oven to about 150. With your hands massage all the oils and seasoning's into the chicken and potatoes. Try if you can to make sure that the chicken is skin side up. Cook uncovered now for about 30-45mins, if like me you cooking some nice fresh bread to go with pop it in now. The chicken skin will start brown and lemons should start to caramelise a little. 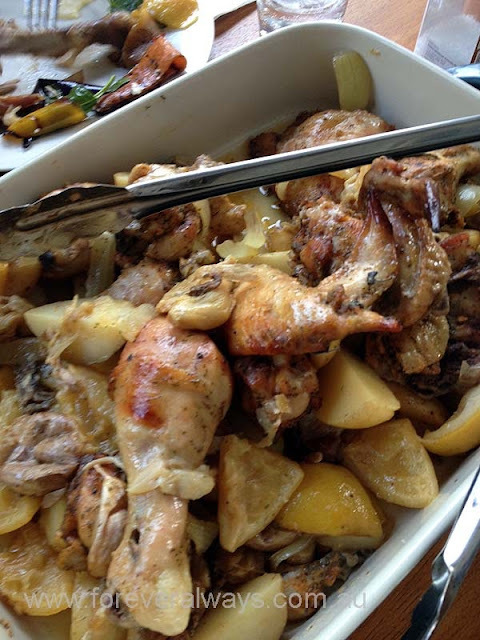 At this point, impressing table service is to transfer the potatoes, garlic bulbs and some of the lemons into a nice serving platter, topping with the chicken pieces. Skim from the top of the baking tray the oily residue - I didn't have too much, a few sheets of good paper towel soaked it up quick then pop the baking tray onto the stove top and reduce that wonderful sauce by about half, and serve in a jug beside your slow roasted lemony garlic chicken. Simple theme. Theme images by Gintare Marcel. Powered by Blogger.